In physics (and in science fiction), wormholes are tiny tunnels through space-time, connecting two disparate points. Though they have never been observed, they are mathematically predicted by the theory of relativity. As Stephen Hawking says, they “occur in nooks and crannies in space and time." In the history of art, by contrast, wormholes are tunnels made by beetles burrowing through wood in search of cellulose and then bursting out at full maturity. When the wood in question is a block used for printing, the circular holes marking the beetles’ escape remain as un-inked traces of the block’s history. While these two kinds of wormhole may seem to have little in common, they both point to the ways in which temporality and physicality are entwined. The cosmic wormhole connects galaxies light-years apart; the mundane wormhole connects (as we shall see) living beings across lengths of time that no single human could hope to span. That is, all wormholes enable time travel, though some do so more literally than others. This essay takes seriously both definitions of "wormhole" in order to understand the woodblocks used to illustrate early modern broadside ballads. The idea of the wormhole derived from physics mimics the telescoping of time we experience when we look at objects affected by the mundane wormhole, like woodcuts. The woodcut illustrations decorating the majority of broadside ballads are often beautiful, sometimes bizarre, and nearly always lively; they were reused, recarved, and recombined across hundreds of ballads and over hundreds of years. We have only a fraction of the impressions that must have been made from these blocks, and a much smaller number of the blocks themselves survive. Thinking of woodblocks in terms of both kinds of wormhole allows us to appreciate more fully how woodcuts and their prints can fold together non-sequential moments in time. Attention to both sorts of wormhole can also help us approach the lives of long-dead creatures—another way to worm backwards in time. Doing so can help us to see how making is a multi-temporal and multi-creaturely process that spans the categories of the natural, the materially-created, and the digitally-created. In this essay, after a discussion of recent work on the subjects of temporality and early modern ballad culture, I will enlist as a time-traveling companion one particular early modern English woodblock, which does not itself survive, and the prints it made on a group of broadside ballads. The image—a woman carrying a feathered fan—appears on ballads over an eighty-year period and can thus help us imagine the larger landscape of a vanished time and place: early modern London. In terms of how material objects can enable time-travel, my choice of this particular woodcut is intended to reveal a larger pattern in woodblock usage more generally. While surviving woodcut prints on broadside ballads represent a mere fraction of actual press output, even those that survive number in the tens of thousands. Almost any could be chosen as a companion in revealing what Jonathan Gil Harris, following Michel Serres, calls the “polychronic” nature of the material object; that is, its ability to “collate many different moments” in its physical being (60). Meditating upon these moments, on their intersections and disjunctions, allows for a richer understanding of how the process of making engages diverse minds and bodies across time. What is commonly called a “wormhole” is more properly known in physics as an Einstein-Rosen bridge. The existence of wormholes was predicted mathematically by Einstein’s theory of relativity in a series of immensely complex equations. Physicist William A. Hiscock explains the concept for the lay reader: “A wormhole has two mouths connected by a ‘throat,’ and provides a path that a traveler could follow to a distant point.” Using the metaphor of a wormhole as a hole made through an apple, he encourages readers to think of space-time as the surface of the apple and to imagine an ant on the surface of the apple as a time traveler. The ant could take many traditional paths across the apple’s skin, or it could crawl through a wormhole inside the apple. The wormhole would in some cases thus be a shorter path to the other side of the apple than a surface journey would be. In terms of actual space-time, this means that, in Hiscock’s words, “traveling a small distance through the wormhole tunnel, you might end up at a destination which could be light-years away through conventional space.” That is, wormholes could make it possible to travel light-years to the distant past or future, making time travel—the ability to reach points in time inaccessible by any other means—possible. If wormholes do in fact exist, however, they are microscopic, and they wink in and out of being quickly. Hawking describes this phenomenon: “There are tiny crevices, wrinkles and voids in time. Down at the smallest of scales, smaller even than molecules, smaller than atoms, we get to a place called the quantum foam. This is where wormholes exist. Tiny tunnels or shortcuts through space and time constantly form, disappear, and reform within this quantum world." The tiny “crevices, wrinkles and voids in time” allow for the existence of wormholes, snaking their way through space-time in unpredictable ways. Our understanding of our own worlds and lives, and of the past, is something other than supersessionary: we exist within a network of memories, hopes for the future, recursive and cumulative learning, and imaginative traversal of time and space at various speeds of thought (memories lingered over, speculative connections made in microseconds). Charnes wonders: “Is it possible to create a transmissible methodology out of reading for temporal ‘wormholes’?” Katherine Koppleman answers in the affirmative, suggesting that we read Geoffrey Chaucer’s often-surreal dream visions not through models of linear time and historicism, but instead in terms of sudden and surprising portals to non-contiguous times and places. For Koppleman, doing so allows us to approach gaps and sudden eruptions in these poems with fresh eyes. Charnes and Koppleman show us how literary works and collections of cultural artifacts are rather like Hawking’s vision of space-time: riddled with “crevices, wrinkles, and voids,” breaks in the apparent regularity of a text’s surface perceptible upon close inspection, and capable of transporting us suddenly into different temporal and spatial locations. The same is true of the material objects that present texts to us, and perhaps especially true of material objects that present texts along with images, as broadside ballads do. Thinking of non-linear, non-supersessionary forms of history enables a richer conception of how things—creatures, objects, ideas—come together across time. As Serres writes, all historical eras “draw…from the obsolete, the contemporary, and the futuristic. An object, a circumstance is thus polychronic, multitemporal, and reveals a time that is gathered together, in multiple pleats” (60). Serres uses the metaphor of points drawn on a handkerchief. When the handkerchief is ironed flat, two points might lie at opposite corners of the fabric. But when the handkerchief is crumpled up in a pocket, these same two points could easily be touching. Just as the wormhole allows for shortcuts through space-time, distant historical eras might be in some respects much closer to one another than to other “intervening” points on a purely linear timescale. Drawing on Serres’s work, Harris asks us to think specifically of temporality as “a polychronic network that collates various actors—human and nonhuman, animate and inanimate, subject and object—from past and present” (16). Creatures and things from across disparate points in space-time can be drawn together by close study of the many manifestations of a single woodcut image. The woodblocks and their prints that form the basis for my study are polychronic in Harris’s sense: they collect multiple moments of time and intersect with multiple temporal scales, and they are made and acted upon by a vast number of creatures and things. One of these creative creatures is the worm Anobium punctatum, also known as the common furniture beetle, which is the source of wormholes appearing in early modern prints made from Northern European woodblocks, including English woodblocks. consuming its cellulose and backfilling their own tunnels, as if erasing their passage through space-time. This passage is made, of course, for reasons practical to the beetles. The cellulose is turned into sugar and protein by microorganisms in the guts of the larvae. Wood that contains more residual protein and sugar is easier to digest and therefore preferred by the species; damp but non-saturated wood, like that of printing blocks, is particularly enticing. In the wild, A. punctatum larvae tend to tunnel for about a year; in more controlled, indoor conditions, they probably require three to four years to reach maturity. Then they pupate (like cocooning butterflies) for two to three weeks. When they reach their adult stage, they burrow out of the wood, leaving a circular hole on the wood's surface. They mate, the females lay their eggs, and the adult beetles die after a few weeks. The lives of A. punctatum, from the point of view of a human’s lifespan, are short and solitary, but the traces of these strange lives remain in the trails that they leave in blocks and prints. And these trails, in turn, can help us to trace the life-histories of blocks and prints hundreds of years later. When blocks containing wormholes are printed, the wormholes show up as circular gaps in the images. One way to date ballads is to study the accumulation of wormholes in their woodcut impressions, as we shall see in more detail below. Biologist Blair Hedges notes that “These tiny errors or interruptions in the print serve as ‘trace fossils,’” meaning that they are not the animals themselves, but evidence of their lives and deaths. Each hole is a piece of a single beetle’s autobiography, a silent memento of its short life visible as a tiny circle that remained un-inked when a print was made from the block in which it lived. But the beetles are far from the only creatures that participated in the making of printing blocks and left their traces therein. To become a printing block, the wood first had to be a tree, so each block is also a record of a particular tree’s life. Foresters cut down the trees; then workers cut them into blocks, so they, too, are makers of woodcuts. Once the blocks were cut and planed, each was made by a woodcarver into a piece of moveable art. For all of these craftspeople, the block’s status as former tree had a practical significance, for cutting wood requires understanding the direction of its grain. For those who carve images, one chisel stroke going against the pattern of the grain can cause whole sections of a design to tear out. In the case of the blocks that made the ballad images discussed below, more stages of making ensued even after the block itself was completed: after carving, the block was made by the compositor into part of the forme, and then made by the collective effort of the pressmen into an impression on a ballad. Its physicality interacted with the physicality of the other non-living elements of the ballad—the paper, the ink, the pieces of type. Nearly all of these non-living elements were made, at least in part, from the remains of once-living creatures. The ballad as it is presented on a computer screen by the English Broadside Ballad Archive (EBBA) has, furthermore, been remade into a digital surrogate, which is nonetheless an object in its own right. It exists as a digital photograph: a complicated construction of binary data rendered by computer software into a visible image via pixels, the smallest possible units of information that can be displayed on a screen. Pixels, usually square, are arranged in a grid and most commonly display a color made up of a combination of red, green, and blue tones, where each of these colors has a gradation range of 256 shades. Clockwise from left: digital image of a ballad woodcut from EBBA; detail from the image showing pixels in grid; two pixels and their RGB color values. The more pixels an image has, the better it looks to the human eye. But an archival-quality digital photograph (that is, one that displays 600 pixels per inch based on the actual size of the original artefact) makes for a large computer file. Accordingly, EBBA reduces the size of its images considerably for web delivery. We also make multiple viewings of each ballad available, to show how each was collected (for example, the Roxburghe ballads were cut in half and pasted into large folio volumes); how it looks on its own; and—in what we call “facsimile transcriptions,” treated in depth in Charlotte Becker’s essay in this edition—how it looks with modern type replacing the often difficult-to-read early modern print. Three views of “A Constant Wife, a Kind Wife,” from left to right: Album Facsimile, Ballad Sheet Facsimile, and Facsimile Transcription. University of Glasgow Library Euing 41, EBBA 31702. In all, we have at least four computer files for each original ballad, and while their digital-material form is not nearly as enticing as that of the printed artifact, they do take up actual physical space in the form of computer drives, both on networked servers and on external hard disks. The digital image of a ballad, therefore, is material in its own right and is created by another large group of makers, some of whom (like the original ballad’s printers) engaged directly with the ballad itself, but many of whom (like those who planed the woodblock’s lumber) had no such direct engagement. The latter, larger group includes engineers and programmers who created the hardware and software needed for the creation and mounting of a digital facsimile and the makers of the cameras used to photograph the ballads. In the smaller group of makers directly involved with the ballad’s digital facsimile itself are the photographers who photographed the printed artifact and the librarians who supported this process. Even more involved with the ballad’s re-making as digital surrogate are the EBBA team members who cropped the photo, transcribed the text, created the facsimile transcription, and mounted all of these files online. In some ways, the ballad was even made by you, the viewer of the digital image, because in order to see it, your brain must recreate it as a series of electrical signals. We find ourselves, then, in the midst of a vast network of traces of living beings, all with their own relationships to the matter at hand. This vast network allows for a kind of travel through space and time (though it is, to be sure, a virtual form of travel). The time-scales of all of these creatures and elements intersect, but they do not all represent the same kind of temporality. 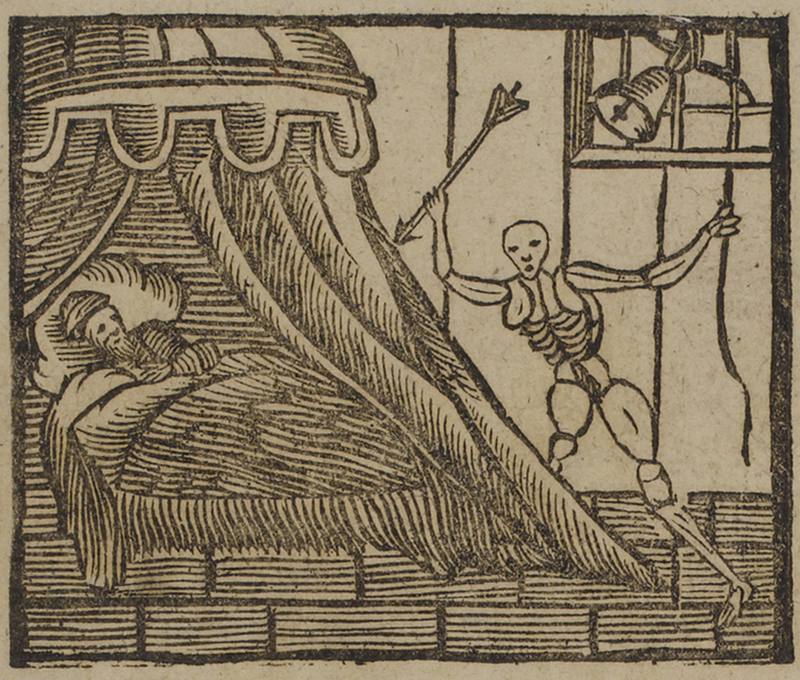 Woodcut impression of a man on his deathbed being attacked by a mort/skeleton with a dart of death. If the block above, which shows a man on his deathbed and a skeleton attacking him with a dart, was carved on boxwood, the material we used in our carvings for this project, the tree may have lived up to 600 years before being felled for lumber. The resulting woodblock might under some conditions last even longer. The printer and his or her apprentices might have had any of a number of usual human lifespans, while the tunneling beetles lived only a few years. A single block, that is, could overlap in multiple ways with a large number of organic lifespans, not all of these lifespans necessarily contiguous. Further, ballads were often imprinted with the same blocks over the course of many years, thus creating their own kind of lifespan that was itself dependent on the durability of the block, and that participated in the block's deterioration over time. Degradation of woodcuts used repeatedly for the printing of one ballad, the “Ballad of Tobias,” over the span of at least thirty years. From left to right: 1655-1658; 1684-1686; 1688-1709. Note particularly the changes visible in the hat of the man in the woodcut over each ballad’s first column (marked by blue rectangles). Even when the same blocks were used in different printings of a ballad, the particular composition of type and spacers placed into the forme for any one printing might have only lasted long enough to pull a few hundred impressions from it. And, as Andrew Griffin notes, “this arrangement of pieces in a forme could be disrupted at any time to make a correction, or because type settled." Indeed, we hope that the ballads presenting prints of the blocks will survive far into the future, both as material artifacts and as digital surrogates; if so, they will continue to span time in ways that are different from but connected to the lifespans of organic creatures. In this way, woodblocks and their prints can be seen as paradigmatic examples of Harris’s assertion that “the objects of material culture are often saturated with the unmistakable if frequently faint imprints of many times” (7). Physically, they incorporate the traces of living tree, woodworm, carver; they show evidence of wear from the press but also of preservation over the course of many years by printers who passed cuts down to their successors. They are thus, in Serres’s terms, polychromic, incorporating physical evidence of many different points in time. 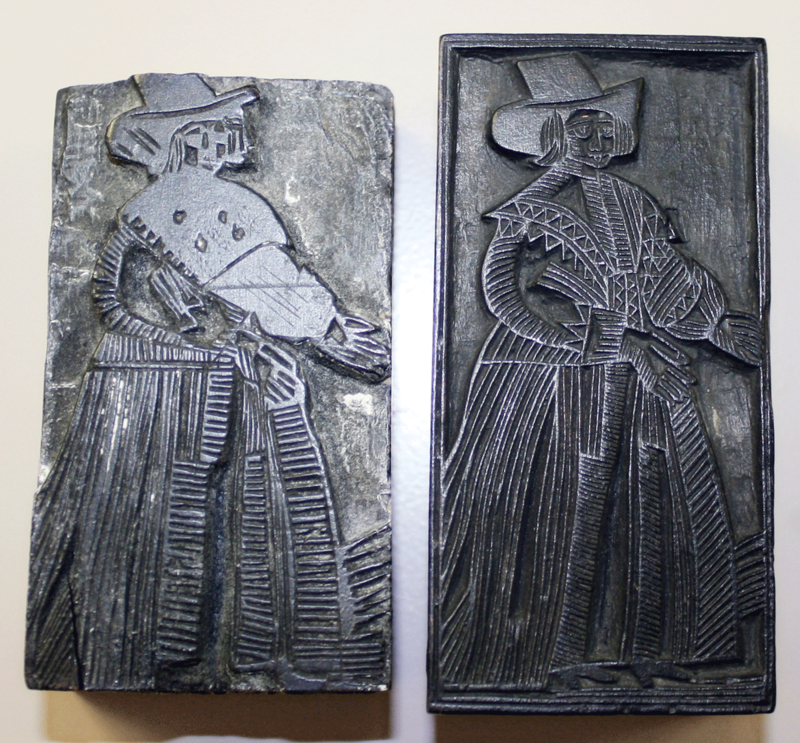 Two woodcuts carved to show the same image. At left: an earlier carving, well-worn from multiple printings; at right, a later, much less-worn, copy. The woodblocks and prints are also, as we shall see in more depth below, multitemporal (allowing for many different experiences of time). Our travel through space-time, facilitated by these wormholes, can bring us imaginatively to many different times and places, in whatever order we wish, from the current moment to the medieval English forest to the day when a ballad was printed to the moment when a woodworm beetle burst out of its tunnel, or into more abstract periods of time such as the English Renaissance, the age of moveable type, or the anthropocene. Whatever point is chosen for the beginning of an inquiry, these woodblocks as material artifacts will always hint at other times and other scales of time. Or, to use Harris’s words, they will reveal “the simultaneous agency of past matter and present subject in reworking our conceptions of temporality” (13). In what follows, we will employ wormholes to tunnel through to the long-vanished worlds of the early modern English printer and ballad-buyer. Even when we have reached our chosen destination, we will still encounter eruptions of multiple time-scales, because broadside ballads themselves are multiply concerned with time—the time it takes to read or sing the ballad, the time it takes to “read” the illustrations, the tempo of the song, the time of the unfolding of the ballad’s narrative or exhortation, the time it took to typeset and print the ballad, the time the song lasted in the popular imagination, the time that has elapsed since they were printed. Let us, then, prepare to enter the wormhole’s temporal vortex. Our companion through this vortex is the woman below, dressed in late-Elizabethan fashion and holding up a feathered fan. 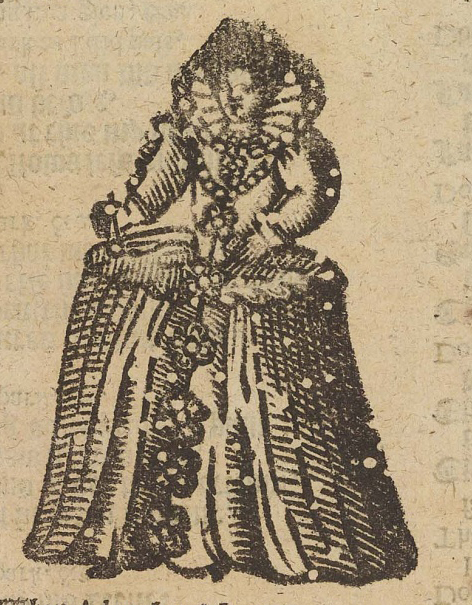 She is an impression from one of at least six different blocks showing the same image; these blocks were used in the printing of at least 100 ballads. Judging from her many appearances on broadside ballads treating a wide variety of topics, she was at once likeable and versatile—both good qualities in a traveling companion. Her first and last appearance on a broadside ballad are approximately eighty years apart. This is a relatively short life for a woodcut; other cuts that appear on ballads lasted for hundreds of years (Nebeker 55). Nonetheless, the wear on the cut bespeaks frequent reuse, which was common for woodblocks, especially in the broadside ballad genre. To some, the blocks' reuse has seemed to indicate that each print is simply one of many, lacking any kind of singularity. This sense of interchangeability was perhaps even more pronounced when ballads were easily obtained; Samuel Pepys attempted to preserve only one copy of each ballad he collected, though sometimes multiples snuck in. To people of later times, though, copies of such ephemeral productions have become scarce, and therefore precious. So, for example, if the only remaining copy of a ballad is one Pepys collected, but the paper is torn and words or images are missing, those pieces are lost forever unless another copy is found. Similarly, when a trove of American silent films was re-discovered in New Zealand in 2009, scholars and film lovers were thrilled. Many of the films, which had been printed on unstable nitrate stock, were long considered lost. Where few copies of an object survive, that is, each copy reveals itself to be an original. With this in mind, it is easier to see distinctions between copies. Indeed, such distinctions are quite visible in the ballad printed for this project, not least because expert printer Sara Stilley corrected many typographic errors in our original forme and re-printed the ballad after the initial print run. Two printings of our ballad; note the corrected upside-down “n” marked by the blue rectangle. 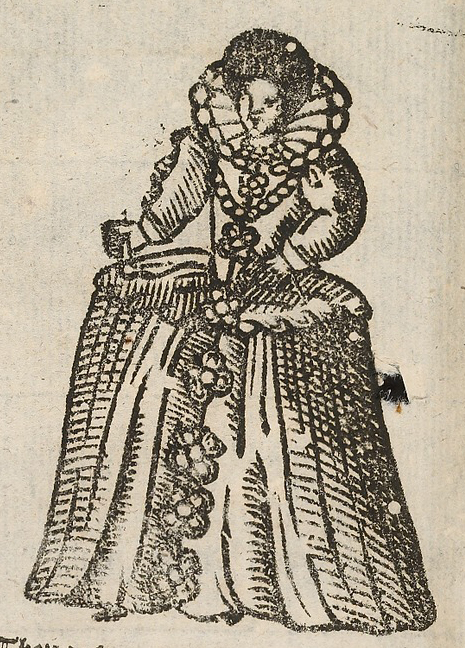 Such distinctions are also apparent in the many extant prints of our Elizabethan traveling companion, whom the EBBA team has nicknamed “Our Lady of the Artichoke” or “the artichoke lady," in honor of the distinctly artichoke-like feathered fan she carries. While Simone Chess discusses the many prints of this woman, she refers repeatedly to “the woodcut,” implying a single entity (34-35). In fact, however, not only were the many impressions of this image made from multiple similar blocks, but the blocks themselves also changed over time, accumulating signs of wear, including loss of features and, as we shall soon see, wormholes. 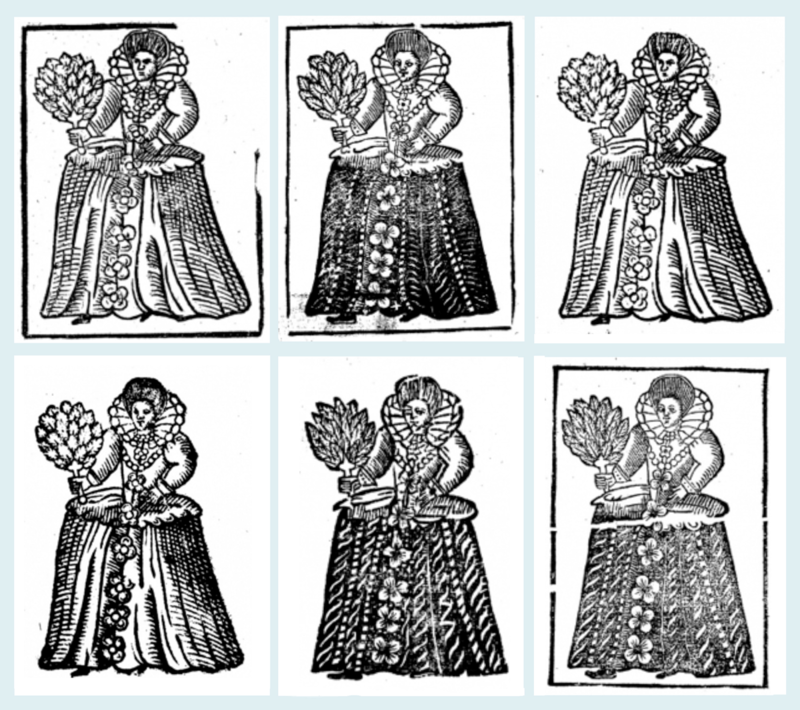 The six “Artichoke ladies,” impressions from similar but not identical woodblocks showing a woman holding a feathered fan. Clockwise from left: Block A (partial border, left eye eventually lost from block); Block B (crack in edge of fan resulting in what looks like a missing feather); Block C (small dip in the lady’s hairstyle; no border); Block D (turned-up nose, less detail in hair; fan eventually excised, no border); Block E (very pointed feathers, large left eye, no border); and Block E (crack across the lady’s skirt). I have lettered each block in accordance with the order of its first appearances in the Pepys Ballads. Let us, then, examine more closely the features of our traveling companion: one Artichoke Lady block that can be distinguished from others by her distinctively turned-up nose and by the loss of the fan she carries, a loss which occurs sometime around 1630. In the archives currently digitized by EBBA, eighteen impressions from this block appear. The cut was held by at least two print shops: those of George Eld and of Alexander and E. Millborn. Eld printed his initials on a ballad entitled “Mr. Playstovves Epithalamium: OR The Mariage of Pandarus and Flora,” which could have been printed as early as 1615. Alexander and E. Millborn printed their initials on “The Wanton Wife of Bath,” printed c. 1692-95. The first is a comic marriage-ballad about the nuptials between a pimp and a whore; its characters end in drunken dissolution. The second tells a story centering on the outspoken Chaucerian character of the title. Though she is called “wanton,” the Wife of Bath here stars in a narrative much more uplifting than that of Pandarus and Flora. "The Wanton Wife of Bath,” printed 1692-1695. National Library of Scotland, Crawford 637, EBBA 33204. Adam runs for his life, to be replaced in quick succession by Jacob, Lot, Judith, David, Solomon, Jonas, Thomas, Mary Magdalene, Paul, and Peter, each of whom also tries to turn her away. But she reminds them of their sins, and they depart quickly. Finally, Christ comes to the gates; he, too, asks her to leave, but she reminds him of the Lord’s forgiveness of the Prodigal Son, and Christ is won over. He lets her in. The ballad is tremendously funny and lively—to give just one example, the Wife calls Judith a “minx”—but its larger point is a doctrinal one about the immensity and flexibility of God’s mercy. In the plot of the ballad, three different modes or ways of experiencing time interact. First is the cosmic time of its setting: heaven is eternal. The Wife’s successful negotiation for a place there is forever; she joins the ranks of such temporally distant figures—distant from each other as well as from the Wife—as Adam, Judith, and Christ. The implication is, of course, that if the reader or singer of the ballad asks properly for God’s mercy, he or she will also join these ranks. The second temporal mode of the ballad is the imagined medieval past: the fourteenth century, when Chaucer (who is mentioned in the second line) was writing The Canterbury Tales. The reader is primed to imagine the Wife’s embeddedness in a bygone era, perhaps even to think of the Wife as a relic of England’s pre-Protestant past. The third kind of temporality is, for the ballad’s original audience, contemporaneity: the Wife is reimagined as a salty-tongued early modern woman, dressed in late-Elizabethan fashion, who tells Adam to “gip, you doting knave!" Chess calls this woodcut “promiscuous,” enlisting both the meaning most common today, “undiscriminating in sexual relations,” and the meaning more common in the early modern period, “Done or applied with no regard for method, order, etc. ; random, indiscriminate, unsystematic.” Outwardly, the artichoke lady fits both definitions: here, as Chaucer’s Wife of Bath, she has displayed what was then thought of as sexual promiscuity by marrying a number of men in sequence. In her travels across broadside ballads, and indeed in her existence in many blocks, she at first blush seems to have been similarly promiscuous, randomly selected to illustrate ballads on various subjects. For many years, the dominant critical view was that ballad woodcuts were chosen randomly or nearly so, without reference to the words of the songs they illustrate—that is, promiscuously. This air of promiscuity, at least in the sense of random choice, is beginning to dissipate, however, as more scholarly attention is paid to woodcut illustrations. It is becoming clear that woodcuts were often chosen quite carefully. 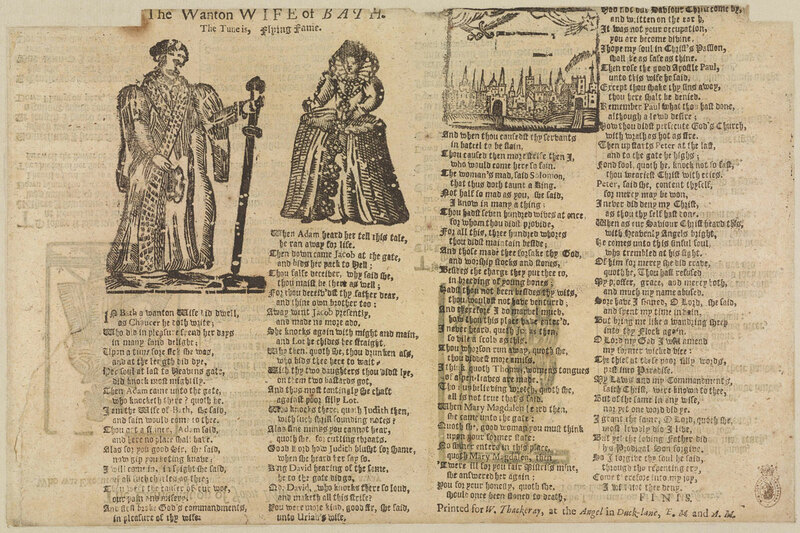 Though they do not always reflect broadside ballad texts in ways that are immediately apparent, they often interact with them to produce a meaning that neither text nor woodcut conveys on its own. Indeed, though the woodcuts that were carved for the Making of a Broadside Ballad project were very much purpose-carved, they highlight specific features of the ballad text: the allegorical cut of the ermine, Queen Elizabeth I’s coronation crown, and the Queen’s initials over the ballad’s first column suggest to the viewer our attempt to re-inhabit the early modern period by endeavoring to replicate its printing technologies. The cut over the second column is part of the musical score to the tune, which is named in the cut: “Auld Lang Syne.” Over the third column, a woman holds up a newly-made sheet of paper and is helped, to her surprise, by a skeleton. Finally, over the fourth column, a skeleton shows off a fully printed ballad. When we discussed the designs for our woodcuts, the idea of skeletons kept coming up, perhaps because the project has put us all in mind of the long-departed craftspeople who contributed to the various stages of labor involved in the making of an early modern broadside ballad. Even when cuts were not purpose-carved for a particular ballad but rather appeared multiple times, popular images seem to have taken on character traits in the early modern imagination, partially because of their associations with particular sorts of ballad. This phenomenon is detailed by Christopher Marsh, who traces the travels of an affable male figure he calls “the how-de-do-man” because of the way the man extends his hand as in greeting. Marsh compares him to a character actor, typecast in a series of similar roles. Likewise, Fumerton and I examine the reuse and recopying of a cut showing a woman with her arms open in terms of her “two-facedness,” her ability to inspire both nostalgia and thoughts of the future. In sum, the artichoke lady and her woodcut ilk are not as promiscuous as they may seem: though they certainly circulate, they often do so within limited and expected boundaries. This is also true of the Wife of Bath. In Chaucer’s original poem, she argues that her supposed promiscuity is in fact sanctioned, because it is within the bonds of marriage. She makes the same point in the broadside ballad devoted to her unique method of obtaining salvation: when Mary Magdalene chides her for her sinfulness, she retorts, “‘Twere ill for you fair Mistris mine, / … / You for your honesty…should once been stoned to death.” The Wife here uses “honest” like Hamlet does, as a biting and sarcastic synonym for “chaste.” Additionally, she chides Adam, Lot, and David for their sexual transgressions. The Wife’s supposed sexual promiscuity is, she implies, less sinful than theirs because she has remained within matrimonial bounds. And in the end, sexual promiscuity is, like other human foibles, forgiven. The three temporal modes of the ballad—eternal time, a past era, and the contemporary moment—converge when Christ welcomes the Wife into heaven. A broadside ballad is more than a verse narrative, however: it was made to be sung, and to be seen as a visual whole in its combination of words and images. Both of these forms of engagement engender distinct sorts of temporality, which are involved in the ballad’s production of meaning. Singing this ballad, like singing any other, allows one to try on the identities of its characters in a way that is not only imaginative but also physically performative. As Bruce Smith has argued, one takes on the words of a singing character not only through an act of imagination but “through the pressure of air in the lungs, certain constrictions of the throat, certain movements of the tongue, the opening and closing of the lips” (176). To sing the Wife’s words is to physically produce them, bringing the singer and the character into intimate oneness. And, as Fumerton has argued, one of the great pleasures in singing ballads is the ability to “temporarily and uncommittedly try out identities, taking them on and casting them off as the song proceeds” (504). In this case, a singer gets to be not only the Wife, but the large cast of biblical characters with whom she argues. Or, if the ballad is being sung by multiple people, its dialogic aspect is enhanced, and the sense of verbal battle is heightened. The singers of the ballad are thus engaged in the interlocking temporalities of the ballad’s narrative, adding their own experiences of lived time to it—the tempo at which they choose to sing, the physical act of creating rhythm, and the amount of time it takes for the whole ballad to be sung. Furthermore, if the singer already knew the ballad, he or she might be reminded of earlier times: hearing it sung by parents, or singing it previously in a tavern with friends. Such remembered experiences would also shape the subjective meaning of the ballad for its audiences. Such embodied experience in the singing of a broadside ballad is heightened by the connected visual experience of viewing its illustrations. Six copies of “The Wanton Wife of Bath” showing the artichoke lady are extant. The earliest version, in the Bodleian Library, was printed between 1624 and 1680, and the latest between 1692 and 1695. 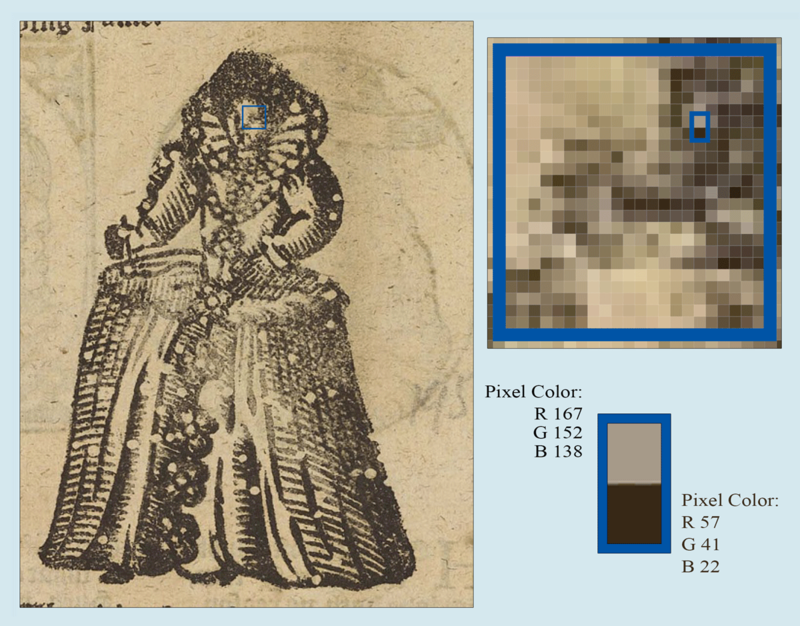 The early version—probably printed after 1640—shows our artichoke lady sans distinctive feathered fan, with a small number of wormholes like the one in her hair and the two along the right edge of her dress. From this state, the block acquired progressively more wormholes until, by its last known use for the “Wife of Bath” ballad, it was riddled with them. The lady’s status as a traveler through time would have been evident to early modern ballad-buyers not only by the growing number of wormholes, but also by her fashions, which would have been out of date even by 1640; they were nearly 100 years old in 1690. Her dress is late Elizabethan—an open cartwheel ruff surrounds her neck, she wears a bodice with leg-of-mutton sleeves, and her skirt is supported by a hoop-like farthingale. The lady is showing her age through more than just the trace fossils of long-dead beetles resulting in un-inked circles on her dress. She is showing them by the very folds in her collar, like Serres’s “time that is gathered together, in multiple pleats.” The repeated use of this woodcut, like the employment of a well-known old tune, communicated the ballad’s relationship with the past. Equally, the recognizability of the artichoke lady to ballad audiences would connect her, too, with the present via other broadside ballads that the viewer had encountered. On the “Wife of Bath” ballads, the lady is joined by a man wearing an ermine-trimmed robe with hanging sleeves, who holds a staff or sword out before him, tilting it slightly outward; he gazes sharply down. Placed to the left of the woman, he seems to be holding the staff between them, as if barring her entry to heaven. Though it is difficult to tell which of the biblical figures mentioned in the song he is supposed to represent, one possibility is Paul, who was often depicted in robes holding a large sword with its point resting on the ground. Whoever the man represents, his placement puts him very much in visual dialogue with the woman, who, because she is without her fan, seems to be shaking her fist at him. A woodcut of a city is placed over the third and fourth columns, and a hand holding a sword comes out of the clouds above it. It could represent the Wife’s earthly city of Bath or Christ’s heavenly city of the New Jerusalem; perhaps, in fact, it represents both. Here, as in any work of visual art, an immediate impact is made upon the viewer; understanding how this impact is made can lead to a greater appreciation of its power. The arrangement of figures on this ballad gives us what Étienne Souriau refers to as a “prerogative moment,” in which the viewer’s “time of contemplation” and the work’s “intrinsic time,” or the slice of time which is captured by the image, share “a moment of coincidence and of harmony” (299, 301). Indeed, recent work by art historian David Freedburg on the connections between art, memory, and cognitive science indicates that “coincidence and harmony” between the viewer of a pictorial image and the figures in that image are quite literal. Freedburg discusses mirror neurons—neurons that fire both when an action is undertaken and when the same action is simply observed—and the somatic basis for empathy. With a scientist from the team that discovered mirror neurons, Vittorio Gallese, Freedburg conducted experiments which showed that looking at a work of art in which a figure gestures activates mirror neurons, with the result that the viewer’s muscles are readied for performance of that same action. That is, our brains perceive visual images as if we were physically involved in the events depicted. A viewer of this ballad, looking closely at the woodcut impressions, experiences neurological activity that makes him or her feel like a participant in the physical actions of the Wife and her interlocutor. The illustrations enhance, then, the embodied experience of singing the ballad and thus becoming one with its characters, as described by both Fumerton and Smith: we feel the man’s frustration in his gesture of separating himself from the Wife with his staff pointed strongly at her; we feel her resistance in her straight posture and raised fist. Our “moment of coincidence” with these characters is experienced somatically. Nevertheless, this moment of coincidence is also a moment of temporal strangeness, because the figure of the Wife both represents a character from a distant era and invites contemplation of a place—heaven—where linear time is abolished. And she always does so from the present in which she's being viewed. In a particularly lyric section of his essay, Souriau writes: “We have been shown only a few selected and fragmentary moments of time in the designated universe, but it is understood that this time, continuing, extends far beyond these moments, and can be reconstructed in our mind on a much broader plane” (298). This broader moment, for the lady in her pleated collar, is both transitory and eternal, partaking of both the past and the present. For viewers familiar with the many other similar but non-identical impressions of the artichoke lady, she might call up not only other ballads but other specific times in just the same way that hearing a ballad tune might. Perhaps a ballad bearing her impression was pasted to a nursery wall or beside a tavern’s fireplace, triggering memories of childhood or raucous apprenticeship in the minds of its viewers. Similarly, the tune of the ballad could associate the figure with moments when the song was heard. I myself am reminded of my first encounter with the Artichoke Lady during my early apprenticeship to the EBBA team, and of the spring break week a number of years ago that I spent printing out impressions of the Lady, painstakingly comparing them and attempting to map a network of ballad illustrations over time. These personal memories necessarily inject an individual kind of meaning to each encounter with the image, adding to the imagined reconstruction of a larger time scale in the image itself that Soriau describes. Further, such personal interactions reinforce the insistence by recent critics on understanding that the human experience of time is multiple and palimpsestic rather than linear. As Charnes puts it, “memory and affect do not obey the dictates of chronology; only rarely do we ‘process’ or complete our relationship to the past in a way that lets us tell ourselves, confidently, ‘that was then, and this is now’” (5). Our minds are capable of moving nonsequentially through the cracks and crevices of our own experience through to the experiences of others—other people, other cultures, other versions of ourselves. The persistence of this illustration across years of printing speaks to a much longer process, beginning years earlier when a very old tree was cut down and continuing into the production of a digital surrogate. This wider span of artistic production manifests the ballad’s imaginative understanding of temporality, extending across and beyond organic decay and bringing together radically non-sequential moments in sudden eruptions of shared meaning. Discussion of "Cutting through the Wormhole: Early Modern Time, Craft, & Media"
Version 5 id 934 of this page, updated 01 February 2016 by Lex Taylor. Created by Brian Reynolds. The Making of A Broadside Ballad by Carl Stahmer and Andrew Griffin and Patricia Fumerton. Help reading this book.